If you are the young one who want to follow your own heart, Then read on and get your proper mentor in this article on Indian Youth Conclave. They held the conclave in Chennai on 10th April this year and now on 14th August, for the first time, the event will be held in Nagpur. 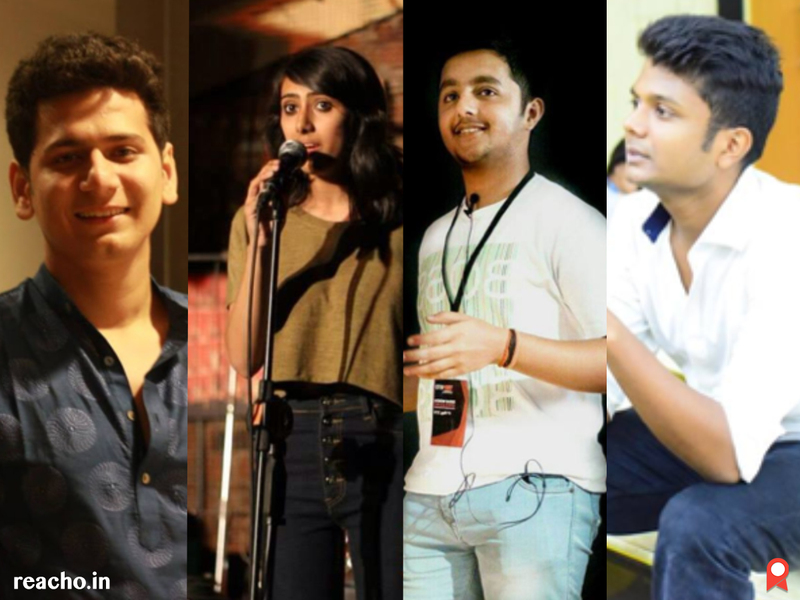 The Conclave brings ‘mentors’ to guide the youth towards their dreams and passions. Here we have brought you part two of getting to know all the mentors. In case you missed the previous one, you can read it here. Terribly tiny tales brings together a diverse pool of fantastic writers to create one tweet-sized story, everyday. They inspire students to write, hold workshops, help students discover their passion. They invite readers to contribute a word from which the writer picks a word of his/her choice. Saniya Rohida has been featured as one of the top twenty spoken word artists of the country, also credited for starting a magazine called The Ellipsis at Symbiosis School of Liberal Arts. Spoken word is an artform that focuses on wordplay and voice modulation to lend a unique touch to poetry recitation. It can be effectively employed to spread a social message as well as convey the poet's deepest feelings. Full Stack Developers. Founders of Zenith Vipers. Yuvraj and his twin brother Yashraj are 16 year old researchers, ideators, roboticists, technologists, inventors and full stack developers. They are the founders of Zenith Vipers, a company which encourages students to come up with their ideas and research projects for the betterment of society. They own 22 research projects out of which 7 are being filed for patents. Their research projects include smart water purifiers, drones, portable angiography machines and portable all in one medical assistance machine nad lots more. He’s Inspired by the magnificence and brilliance of the Human Intelligence, and hence decided to bring the same to the students by starting a one-of- its-kind Coaching Academy. He’s passionate about kindling the young minds and believes that it’s the passion that lights our way to success, greatness and real potential! She is Managing Director of Eminence Arts & Education Pvt. Ltd. She Designs and publishes Handwriting and Calligraphy Books . She is a motivational speaker. She also runs Helen O' Grady International Youth Theatre Program that aims to build up strong communication skills and confidence through drama!! She is a National, Soft Skill and Helen O' Grady International trainer!! He has a US patent on stock algorithm analysis valued at US$ 2.1 Million (12.5 Cr), ABROS financial services (tie up with quantopian)! He's also a mentee at the very prestigious O'Leary Financial House and is a recipient of Scholarship from the Wharton Business School, Pennsylvania. Abhilekh is also presently interning at Goldman Sachs and has founded Startup Street. Alvin Presley is a musician from Chennai and plays for the band Attva. Yohan Dongaji & Sudarshan Barai decided to hit the roads with their main objective of starting a restaurant. They opened Bawa Restaurant near old VCA stadium in Civil Lines in Sadar to bring alive the tempting taste and rich aroma of genuine Parsi cuisines to please the senses of Nagpur food connoisseurs. Mahesh Rakheja is a popular technology speaker, well known for speaking and writing on Cyber Security. An ethical hacker and a technologist, he has spoken at forums like thehackerconference and has been covered by all media giants in the industry. Bahaish Kapoor, is a short film director, cinematographer and composer. He is the son of Indian actor, author and film-acting trainer, Kishore Namit Kapoor. AIESEC is an international non-governmental not-for-profit organization that provides young people with leadership development and cross-cultural global internship and volunteer exchange experiences across the globe, with a focus to empower young people so they can make a positive impact on society. The AIESEC network includes over 100,000 members in 133 countries and territories. It is the largest youth-run organization in the world. Young entrepreneur from Nagpur. At an age when young people are more interested in partying, Azeem saw an opportunity and turned that into his business. He has come a long way since then and has established his own restaurant 'Gulf Grill' while finishing his degree in mechanical engineering from raisoni college. Azeem has made his stronghold in the event management and hospitality sector. He aspires to bring a change in Nagpur that will leverage development of the youth. Reacho is a new age media statup from Nagpur. It focusses on providing engaging content (local and global), targeting the Indian youth. The local content includes interesting stories about the city, events, local food specialities, places etc. Global content section (called Discover) delivers choicest youth focussed news from entertainment, food, travel and lifestyle verticals. Ketan Paithankar, a co-founder, will be representing Reacho at the Conclave.